I love Page Objects, however I dislike the name. With the page object model, we encourage abstraction of the DOM (or whatever locators you might use for functional UI testing). This is a good thing (TM). Unfortunately, the term Page Object doesn't convey the benefit of modelling applications at a more granular level. Code reuse and encapsulation does not begin and end with pages. Rather, individual components should be modelled where appropriate. One should not rigorously apply DRY principles to plain English test cases (for Cucumber/Gherkin fans out there), but backing code sure as Hell warrants it. If you've used page objects (or some similar abstraction), you're a cut above the rest, but please, don't take the name too literally. Feel free to model smaller components. If you need an algorithm, data structure or just a bit of light reading, there's plenty of material over at xlinux.nist. JSPerf: Favour prototyped object over module pattern? Goodbye JS closure, let's use some prototypes. Does the performance benchmark still work? On my first round of optimisation, this seemed like a possible candidate. As this was a K-Line, I reconnected via another server. Some time later I was, again, banned. 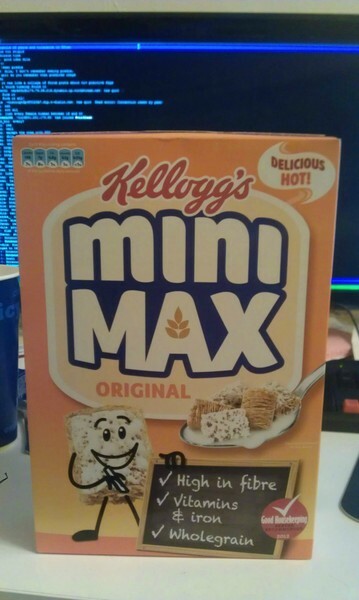 Kellogg's must have a game theorist in their product development team. It's the most important meal of the day, so minimise your maximum hunger today! Presently, they only support Mac OSX, but I played around and got it reasonably happy running on an Ubuntu 12.04 VM I had laying around. I recently hacked together a project prototype using Amazon Web Services. I store various files using Amazon S3 and access them via Amazon's Cloudfront service. In my case, Cloudfront adds very little to the solution other than leaving me free from worrying about catering to multiple regions in the prototype. This is because in ideal operation of the system, each file should be fetched once and only once, barring exceptional circumstances. All other requests for the content would be expected to return a 304 (Not modified) response. I currently use an If-Not-Modified header to perform cache control, which for the most part works well. However, every now and then Cloudfront insists on returning a full 200 response, despite the ETag matching exactly. This happens maybe once in 100 times on smaller files. Although I haven't been able to test this in more depth, I suspect it happens more frequently with larger files.